Rev. 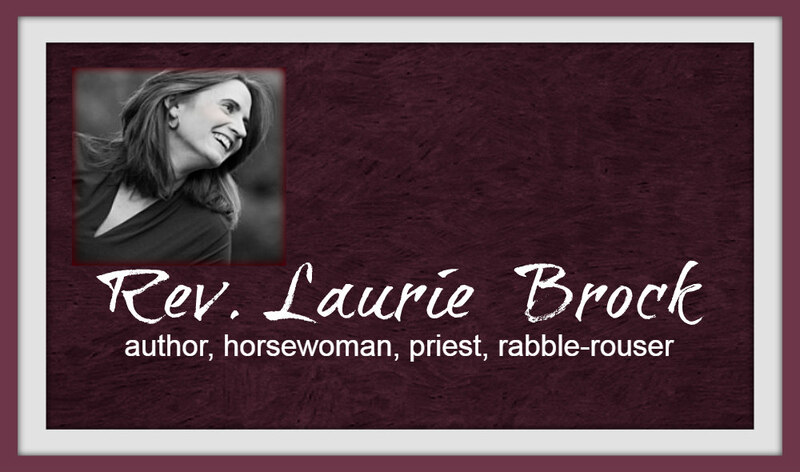 Laurie Brock: Do You Believe? Years ago, during a conversation with a friend while I was at the end stage of a relationship, she asked me during my lament over ice cream about the whys and hows romantic relationships come to an end, what I wanted from him. I recommend everyone has one of these friends, who will say the things we don’t want to hear in the middle of our grand pity parties to shock us out of our own egos. He’d been saying he wasn’t in the place to be in a relationship. And I, in my grandiose thinking, decided I knew better about his own truth than he did. I responded I’d had the same experience. You can imagine our delight when we realized we were talking about the same guy. He was telling me his truth. We don’t, however, get to tell others what is and isn’t their truths. We instead can decide if we choose to believe their truths. And here’s the fun part - our decision NOT to believe another’s truth says far more about us than about the person. Often, when we choose not to believe another’s response to us, we have a narrative within ourselves we’re trying to sustain. Belief, after all, is a mysterious creature. We confess our belief of God, Jesus, and the Holy Spirit in the creeds, but the exact hows and whys of that belief in some ways is a journey individual to our communities. Sometimes we believe because we see. Other times we believe even when we don’t see. Belief can be the result of evidence gathered over years or no evidence at all held together by deep desires and needs. Different people can see the exact same thing and have entirely divergent beliefs. We Christians promise to believe in God, Jesus, and the Holy Spirit. That belief leads us to respond in love to one another and ourselves. One way we express that love in the Episcopal Church in through the promise in our Baptismal Covenant to respect the dignity of every human being. And in a basic way, that invites me to believe their truths instead of using my own confirmation bias to interpret them in ways that support my narrative or my needs at their expense and denigration. We’ve all been there, I suspect. That moment when we invite a coworker to dinner and she declines, saying she’s had a long week. And instead of believing that’s her truth, we engage in speculation. “She always says that. She just doesn’t like me. She wants my job. This always happens. I work hard and get stabbed in the back.” Or whatever narrative we need to tell to ourselves. Amazing how much we can disbelieve when people tell us their truth. Maybe that person has a long history of telling us lies, so then perhaps we might ask ourselves how boundaries can be appropriate in a relationship with one who is fast and loose with facts. Maybe we think the person should tell us more than s/he is. Every person owns her/his story, and I don’t get to tell them what it is or that they have to tell it. Period. Love invites people to tell their truths as they are comfortable doing so. It does not force someone to disclose. Maybe we need to recognize we don’t want to hear another’s truth. If so, that’s our stuff for us to explore. Often, when someone isn’t conforming to our wants and needs, we express this through our own disbelief of their truth. Her observation holds truth. In a court of law or a press conference, skepticism and questioning and explanations are deeply appropriate. In our relationships with each other? I don’t want to be in relationship with someone who cross-examines me. Instead, I want to be believed when I fully speak my truth and when I can only speak part of my truth. I don’t want someone to hear my truth and tell me through word and action they have another truth they’ve manufactured for me to crush into my soul. I don't want to be in relationships with others who presume to know my truth. Maybe we could ask how might our bonds of human affection be strengthened if we chose to believe the truths others share? How might we be transformed if we allowed those truths to shine some light on truths about ourselves? How might love deepen if we choose to believe? Many thanks for another insightful post. About 15 years ago, I was talking with a dear friend who was in the middle of an untreated mania. She and her husband were less than compatible those days. My friend maintained that although she and her husband agreed on very little, they DID agree that I was no expert on the issue of relationships. She put me in my place. My friend is doing much better these days. She takes her medicine as required and we text daily. She and her husband are also getting along much better. heard about 35 years ago that if the whole world says you're an elephant, it is time to start looking for peanuts. Listen to the good and bad things people say. The validity is in their frequency.